The most complete variety of Vermont's favorite taste traditions at a tremendous value. SAVE $11.66 compared to ordering items separately! The gift is packed in our traditional gift packaging. 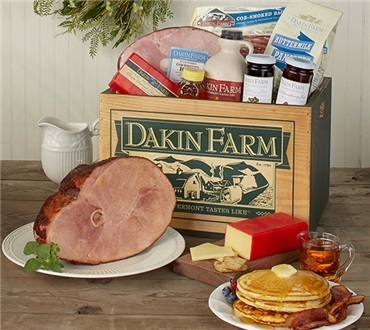 If you would like it packed in the Dakin Farm Wooden Box (picutured) please select the Wooden Box option from the drop down below. A Great Family Christmas Gift! Our two most impressive gifts were for our children, our son and his family and our daughter and her family for Christmas gifts. They loved them in 2010 when we gave them in the wooden box.For Christmas 2011, we gave just the impressive gift in the cardboard box. Each family enjoyed the hams and did a family breakfast with the kids helping to cook the pancakes, syrup, bacon, etc.We have not sampled any of the items. Perhaps we will have to send an impressive gift to us next time we order! We had most everything for breakfast, but saved the Ham for New Year's Day dinner. My son was home on leave for the holidays and ham is his favorite. It was a hit. Very good.